Today, Hannah decided that she wanted to get her ears pierced and she was ready for it. We double and triple checked with her to make sure that she absolutely wanted to have it done. We even told her that she could walk away if she was afraid as she sat on the stool waiting for the procedure. She still insisted that it was a GO! Hannah did amazingly well. 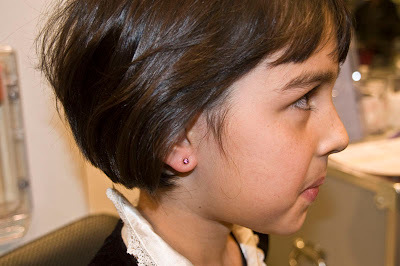 She asked to see the piercing apparatus and asked the lady a few good questions before the procedure was conducted. She did not flinch or cry at all. I'm so proud of my little girl.